You can now vote for Conservative Libertarian Fiction Alliance Book of the Year. You do NOT have to be a member to vote. Sharp eyes wil note a Horde writer appears on the list twice. I've reviewed a couple of the nominees, by the way. Voting ends on June 30, midnight. You can vote directly at Survey Monkey. Or learn more about the awards at the CLFA site. 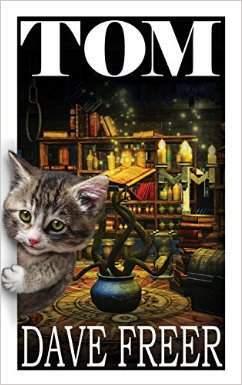 And also in CLFA news, Tom is new fantasy release by one of its members, Dave Freer. The cover is so cute I just had to put it up. Tom is a cat in trouble. The worst possible kind of trouble: he’s been turned into a human. Transformed by an irascible old magician in need of a famulus -- a servant and an assistant, Tom is as good at being a servant as a cat ever is. The assistant part is more to Tom’s taste: he rather fancies impressing the girl cats and terrorizing the other toms by transforming himself into a tiger. But the world of magic, a vanished and cursed princess, and a haunted skull, and a demon in the chamber-pot, to say nothing of conspiring wizards and the wickedest witch in the west, all seem to be out to kill Tom. He is a cat coming to terms with being a boy, dealing with all this. He has a raven and a cheese as… sort of allies. And of course there is the princess. Just reading that makes me smile. Sounds like a great summer read, specially for cat lovers!